I am not able to select only the top 10 winners YTD in the Dashboard tab. 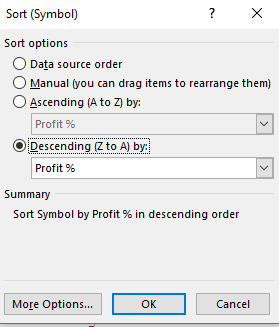 Instead it sorts all my holdings in the descending order. thanks for sharing your inputs. I was looking to have only top 10 holdings sorted in the descending order. With your above recommendation, I shall get all the holding sorted. I think the functionality to do top 10 is currently greyed out. When you click on the same button, you should have an option for "Value filter" and then "Top 10". If "Top 10" option is greyed out, you probably have another filter that you should remove and then you should be able to select Top 10.